But people are people and “living in beautiful places can be just as hard as living in the most soul-crushing cities,” write editors Grady and Graff. And then this group of short-story writers prove what the editors say is true in stories where friends kill each other out of class jealousy and where women find trigger-finger grandpas with dementia can come in plenty handy when trying to shake a small-town, stalker-ish lawman. You don’t need to read any more to know things are not going to come to a good end for Carla’s stepfather. The book has that strong sense of place, as do all the books in this series, and the stories here are broken into four geographic sections, which is a nice touch but lost on non-Montana natives. All the stories are universally strong and succeed in placing the reader in the fictional universe created by the writer whether the story is about a murder mystery, the tale of a stripper seeking a second chance, a drug-dealer with a heart of gold or a wayward son returning to settle old scores. The book begins with “Red, White, and Butte” about a morally bankrupt Afghan vet out to sleep with his dead war buddy’s widow. This being the Wild West, that never happens and town justice prevails. Thomas McGuane’s “Motherlode” is particularly strong, presenting a dopey mama’s boy whose only talent is sticking his arm up a cow’s rear end to determine whether the cow is pregnant and how far along she is. For sure, it’s a talent and one in high demand but it’s hardly enough for David, “the genius preg-tester,” who instead is envious of the life of a two-bit criminal who winds up kidnapping David with a toy gun. When you measure your life against those “achievements” you may come to a hard end, as David learns. Two stories resonated long after reading them: “Fireweed” by Janet Skeslien Charles about a stranger mysteriously murdered in a small town where everyone becomes a suspect; and “Trailer Trash” by Gwen Florio about two writing friends who compete with one another. When one gets into a prestigious writing program and the other does not, class warfare and fisticuffs erupt and the snooty elites who look down their noses at the rejected writer’s offerings find that he ultimately is the one who creates the better story even if he has to resort to murder to find his plot. 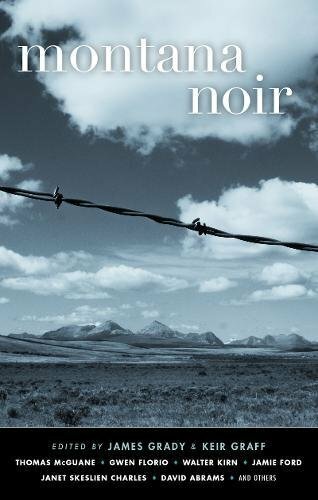 Montana may not have the back alleys so common to noir but it has western justice which can be quick, brutal and final and that is as satisfying as anything found in the urban streets that typically attract the dark beauty of the noir genre.